The 2012 London Olympic Games are now in full swing. Why not challenge yourself to train like an Olympian and take our Olympic Challenge? We recently concluded this challenge with one of our corporate partners, and the teams seemed to have a lot of fun with it – so try challenging yourself each day with some new exercises to add into your workout. With four weeks worth of challenges, you can keep your workouts fresh for the entire month. 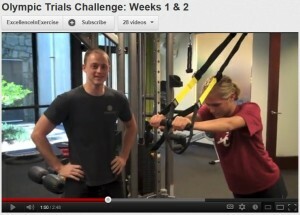 We also include demonstration videos for each week – check it out! Disclaimer: All exercise recommendations and videos on this site are for your information only and are not to be used in placed of working with a professional. Be smart. If you need help, ask for it. Get approval from your doctor before beginning any exercise regimen and make sure to use caution when doing any type of exercise. Thanks to Ryan Kilpatrick & T.R. Wilhoit for their work on the Olympic Trials Challenge & exercise schedule.